Another severe storm walloped the East on Friday, delaying flights, closing scores of schools and leading to at least one death. 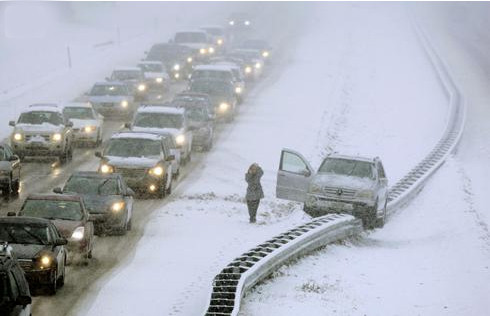 The National Weather Service issued winter storm warnings for much of upstate New York. Forecasters said areas outside Albany could get 12 to 16 inches. As much as 8 inches of snow fell in Albany by noon Friday. In a suburb of Rochester, a 34-year-old woman died Friday afternoon after she was hit by a Pittsford plow truck backing up in a parking lot. A 30-mile stretch of the New York Thruway was closed by an accident south of Buffalo, and in Maine, dozens of cars were reported off the road. Maine State Police said a man was critically injured in York when his pickup overturned on the Maine Turnpike. The storm will drop between 4 and 14 inches of snow around Maine, with sleet and rain mixing in some coastal areas. Flights out of New York’s metropolitan-area airports were delayed by the rain and wind. Departures out of Newark Liberty International Airport flight were delayed an average of 3 hours. LaGuardia Airport had departure delays averaging more than 2 hours. At Philadelphia International Airport, high winds of more than 60 mph and stormy weather in other cities caused flight delays and cancellations. Arriving flights were experiencing up to 2-hour delays, and more than 100 flights were canceled. Winds gusted to 30 mph in some areas along Lake Erie. Most flights were canceled Friday morning in Cleveland, though a spokeswoman said Hopkins airport remained open. Dayton’s airport shut down for about three hours Friday while slick runways were treated. Flights resumed just before 9:30 a.m.
A winter storm warning stretched across Ohio’s northern third with potential for 8 inches of snow. The Cleveland, Toledo, Akron and Canton school districts called off Friday’s classes. Zoos were closed in Toledo and Akron. Meanwhile, drenching rain in southern Ohio submerged some roads. The National Weather Service said the region could receive more than 2 inches of rain.